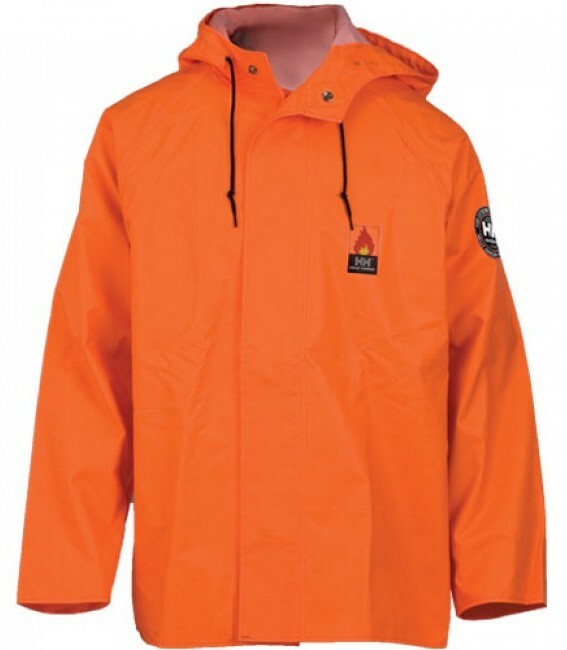 This waterproof jacket is constructed of PU-coated knitted polyester and features a fleece inside collar for extra warmth. 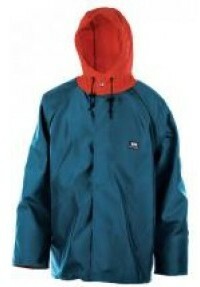 T he hood has drawcord and Velcro® adjustments, and an opening in the back of the jacket allows for ventilation. 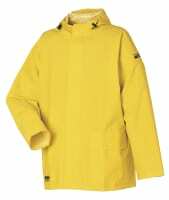 Features two hand pockets with flap closures, one chest pocket with zip closure, and one sleeve pocket with zip closure. Also features a storm flap with zip closure and a Velcro® adjustment on the bottom hem of each sleeve. Woven, heavy-duty PVC-coated fabrics are recommended for tough wear and tear, plus they are resistant to oil, petroleum, concrete and chemicals. Jacket features a drawcord hood and double storm flap with snap closure. - 0.35 mm PVC Coated Woven Polyster 400 g/m2 mid weight. 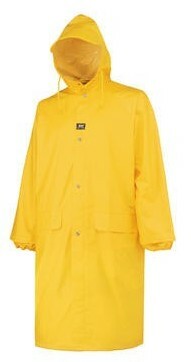 Available in dark green or yellow. 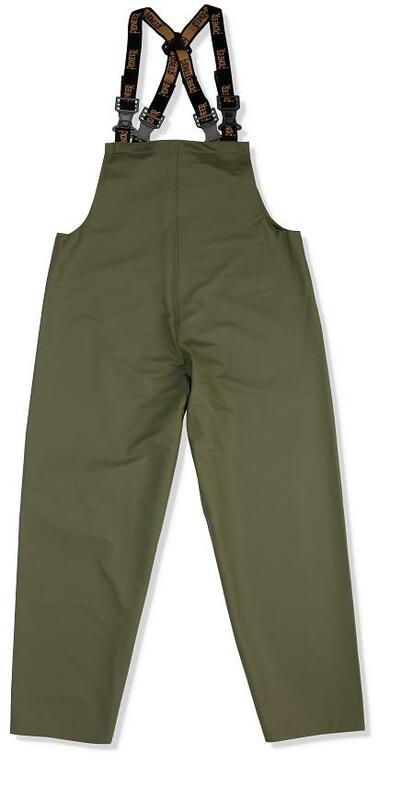 These double bib pants are reversible and can be worn back-to-front for longer wear. They are generously cut and come with flexible, adjustable suspenders and side gusset for easy entryWoven, heavy-duty PVC-coated fabrics are recommended for tough wear and tear, plus they are resistant to oil, petroleum, concrete and chemicals. Bib Overalls have click-type connectors on the suspenders. 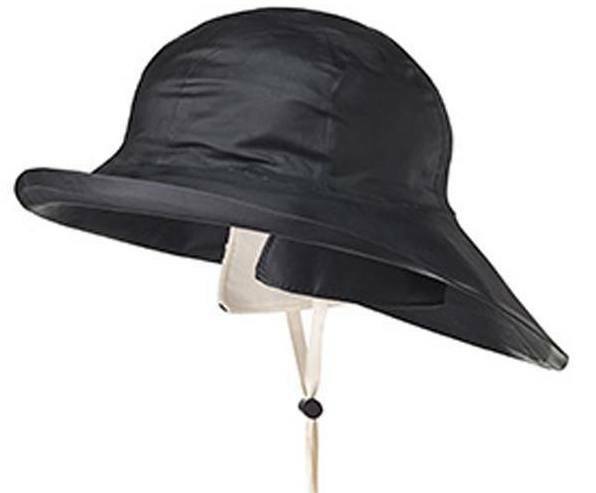 -Storm flap with push button closure. 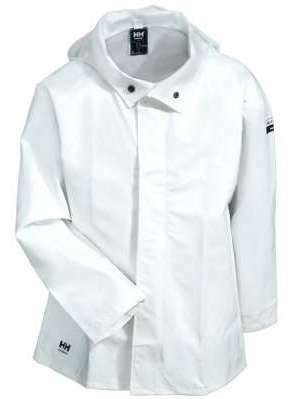 Classic PVC rain jacket in highly durable 410 grams fabric EN 343 3,1 Waterproof PVC coated Polyester. 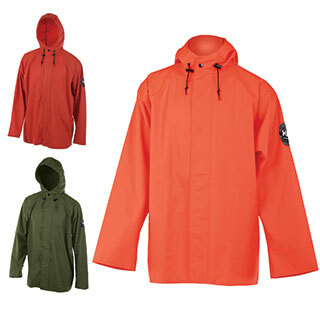 Lightweight and waterproof, this jacket features MicroWelded™ seams and a drawcord hood. Outer storm flap with concealed Marlex snap closure. Inside storm flap. Attached 3 panel hood with drawcord and cordlocks. The generous cut combines with the supple fabric to provide a very comfortable fit. Sizes: XS-3XL. Available in Green, Dark Orange, or Orange. 0.24 mm circular knit polyester backing with stretch polyurethane coating. Vented back and MicroWelded™ seams. Generous Cut, Double entry front pockets, Front zip with snap storm flap, Attached hood that tucks into teh collar, Hook and loop adustable Velcro®, Two water-proof pockets and hand warmer pockets. Sizes: S-3XL. 70148 Available in green-brown, navy blue, or black. This pant provides complete waterproofness without the weight of some of the heavier rainwear garments. The stretch fabric allows exceptional freedom of movement. 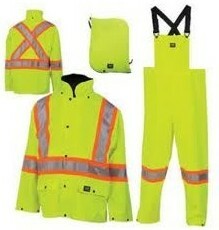 Single bib pant features adjustable elastic suspenders and MicroWelded™ seams. Sizes: S-3XL.  Available in Green, Orange, or Flo-Orange. 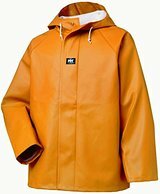 This is a lightweight, industrial strength, tear resistant rainwear. 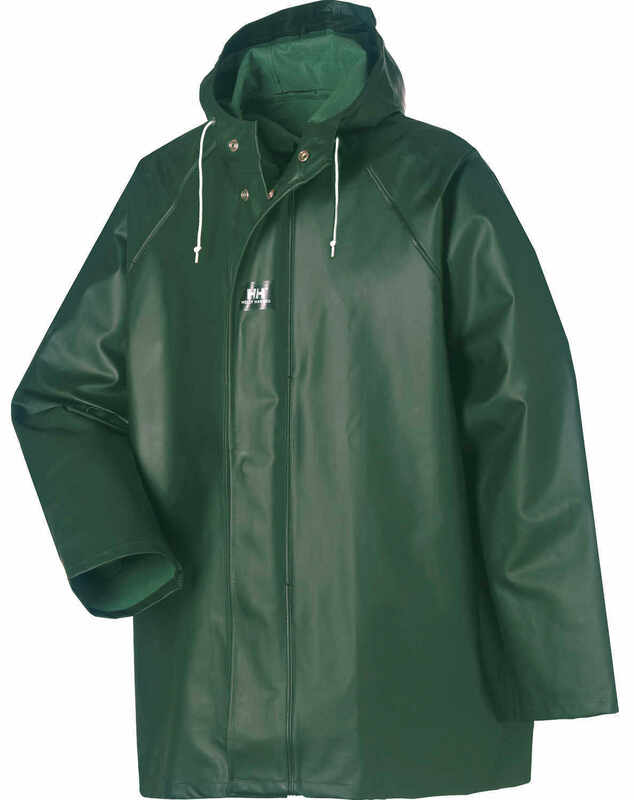 The high tenacity 420 Denier used as the protective outershell gives excellent tear and puncture resistance. The inner layer of Impertech stretch fabric is lightweight, comfortable and 100% waterproof. 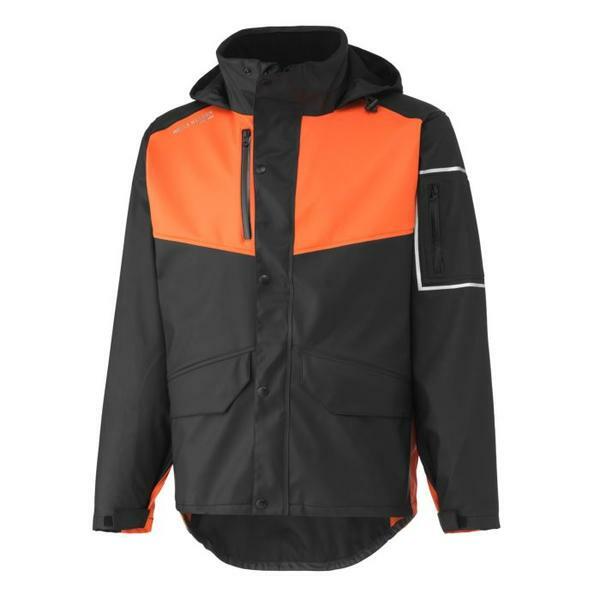 This two-layer jacket features an inner layer of Stretch Impertech fabric. 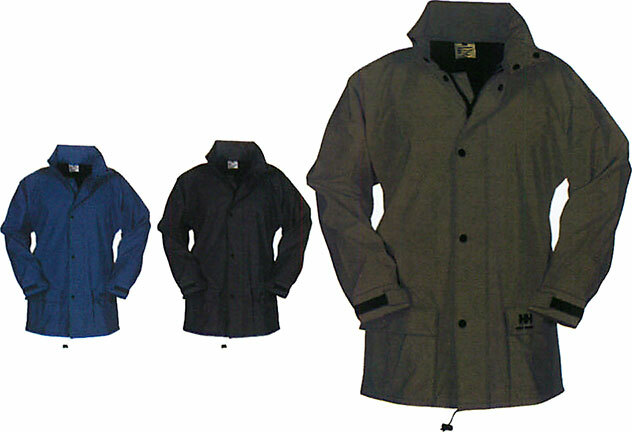 MicroWelded™ seams with an attached drawcord hood guarantee 100% waterproofness. 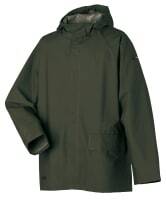 A tear resistant high-tenacity outershell covers arms, front and back. Inner sleeve storm cuffs provide comfort and dryness. Inner storm flap closes with rust resistant nickel plated brass snaps. Sizes: S-3XL. 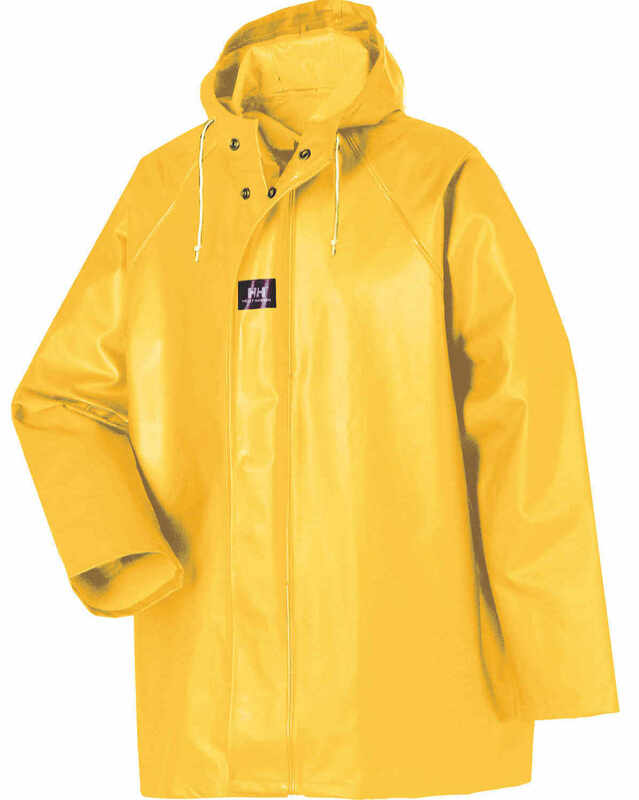 Tear resistant outershell of durable, high tenacity 420 denier nylon. 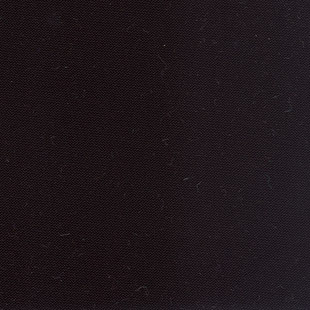 Inner layer of 170g/m2 PU coated nylon knit Impertech waterproof fabric. Neoprene inner stormcuffs for comfort and dryness. Generously cut 3 panel drawcord hood with cordlocks. Two layer hood with high tenacity exterior for added durability. Improved inner and outer stormflap for durability. Concealed stainless steel rust resistant snap closure. Inner layer has microwelded™ seams. Sizes: S-3XL. This two-layer bib pant features an inner layer of Stretch Impertech fabric. MicroWelded™ seams, a generous cut and a side gusset for easy entry. A tear resistant high-tenacity outershell covers the entire pant. Sizes: S-3XL. Black heavy-duty vulcanized rubber. Ear flaps. Cotton lined. 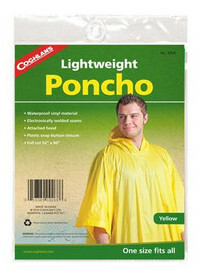 100% waterproof. Chin Tie-Down. Sizes: Medium to X-Large. 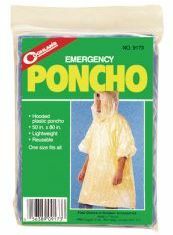 Hooded polyethylene poncho. 50 x 80 inch (127 x 203 cm). One size fits all. Lightweight, reusable. Waterproof vinyl material. Electronically welded seams. Attached hood. PVC snap button closure. One size fits all. Full cut 52 x 80 inch (132 x 203 cm). 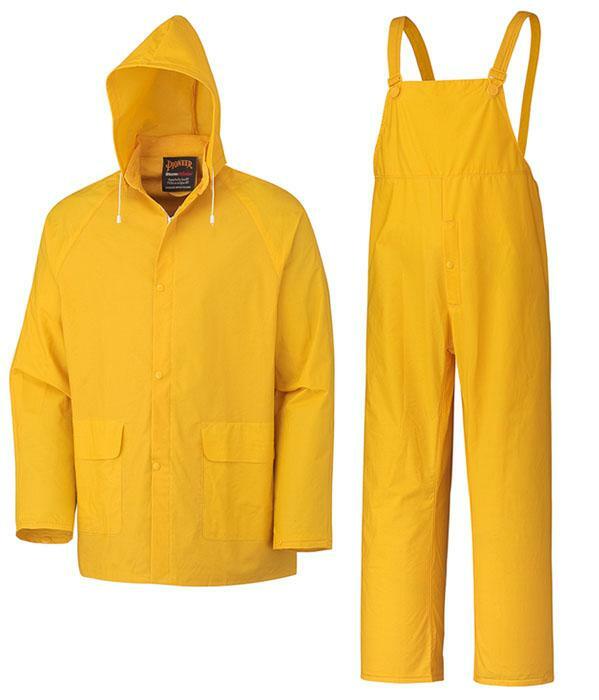 Three piece rain suit: detachable hood, jacket and bib pants.  Made of yellow .25 mm gauge PVC. 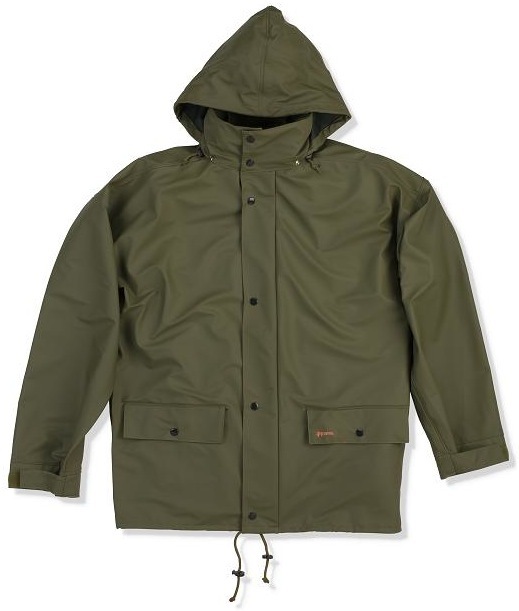 Jacket features corduroy collar, storm front and two front pockets. 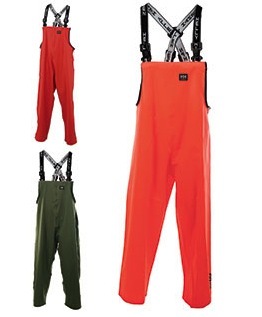 Bib pants feature adjustable elastic suspenders and button fly. Snap-on hood ties under chin. All plastic snaps are dielectric. Sizes S-XXL.